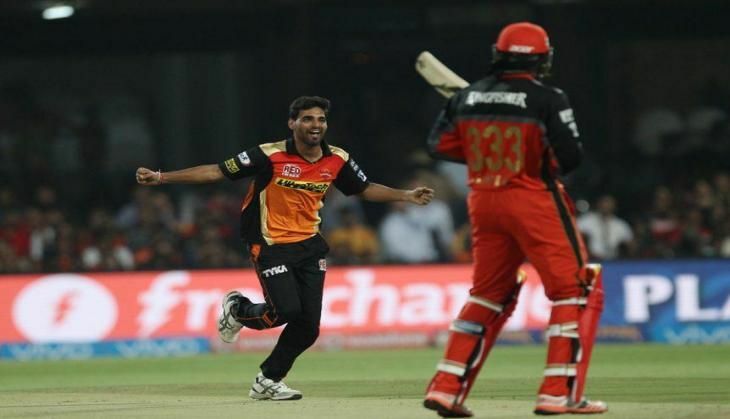 Sunrisers Hyderabad (SRH) seam bowler Bhuvneshwar Kumar has credited veteran pacer Ashish Nehra for teaching him the art of deceiving batsmen. The Sunrisers set up a mouth-watering summit clash against the Royal Challengers Bangalore (RCB) after defeating the Gujarat Lions by four wickets in the second qualifier of the Indian Premier League (IPL) at Feroz Shah Kotla on 27 May. Bhuvneshwar, who shouldered responsibility in the absence of injured Nehra, admitted that the veteran bowler's advice had helped him improve his bowling skills and proved crucial in back-to-back knockout games. "When you are bowling together there are little things, like how you set the field, what is the strength of which batsman and so how do you bluff him - little things like that which he talked about which has helped. And that is probably what I tried to help (Barinder) Sran with. I know that I can't do what he (Nehra) did with his experience. But I was trying to do and play the role that he did," Kumar was quoted as saying by iplt20.com. "What happens these days in cricket is that watching the way you set the field the batsman knows what you are going to bowl. But as we play more and understand opponents better, we try to bowl against the field that we have set, but not to the extent that it backfires. What we try to do is to be able to bluff the batsman, stop the runs, and get the batsman out," said the 26-year-old, who grabbed the purple cap after becoming the leading wicket-taker in the tournament. Chasing a 163-run target, the Sunrisers relied heavily on captain David Warner, who remained unbeaten on 93 to steer his side into the final with four balls remaining.